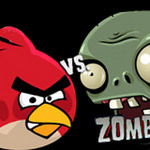 Free to Play Angry Bird VS Zombies, start your free game now (2016). Description: In this cold winter, plants have withered. The eternal zombies feel so boring, they go around looking for new targets. Suddenly a bird flying overhead, what zombies think the new fun, they track the bird's nest, and brought a large number of zombies come together. The birds see the going trouble and going to fight for the life. Therefore a bird dead team was born. Let's help the poor birds.